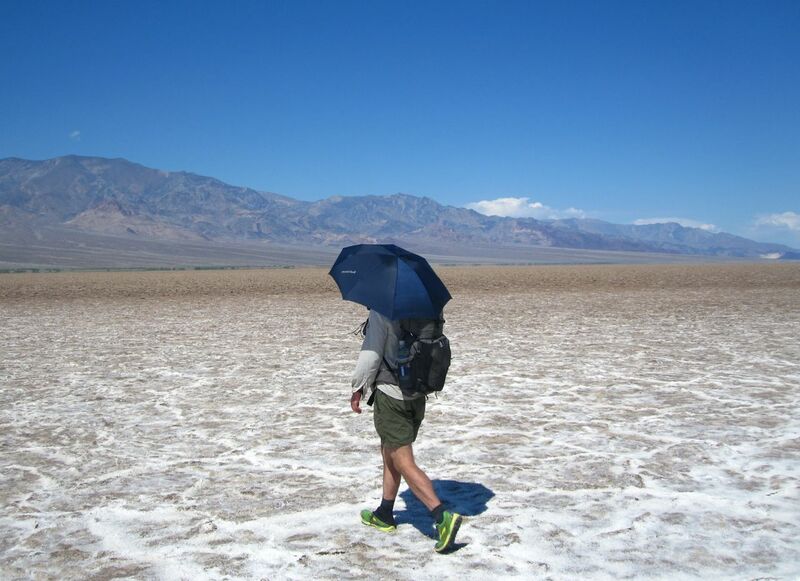 Crossing Death Valley with the Montbell UL Trekking Umbrella | Lowest to Highest Route, CA, USA, 2014. I bought my Montbell U.L. Trekking Umbrella in 2011. 1. Weight – Tipping the scales at 5.8 oz (165 grams), it was the lightest umbrella I had seen. 2. Durability – The folding hinges & gossamer-like materials, made me wonder whether or not it would hold up long term. Include: Queensland, Australia (summer), Pacific Northwest (autumn), southern California (spring), Colombian Andes (summer) and Mexico’s Sierra Madre (all seasons). 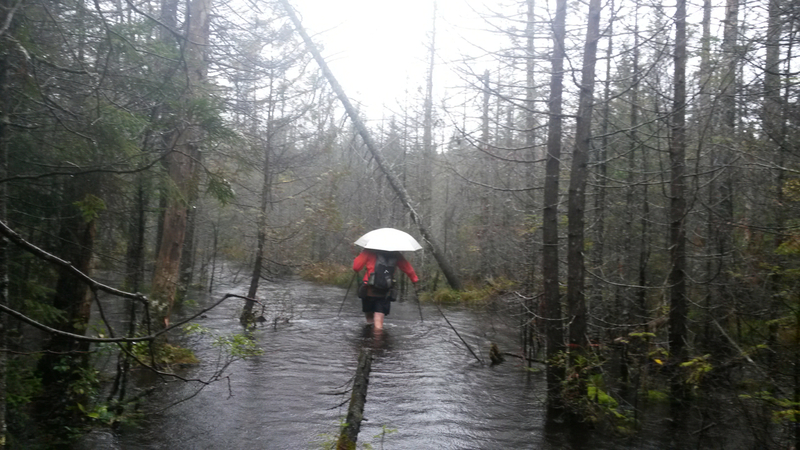 Note: I don’t carry an umbrella on all of my backpacking trips. In certain environments, I think they’re more trouble than they’re worth. Click here for a brief overview of the conditions for which I think umbrellas are well suited. Telescopic: The folding hinges of the Montbell U.L. are what make it so compact. As I alluded to in the introduction, at first glance I had my doubts in regards to the durability of this particular feature. However, in practice they’ve held up fine; they are definitely tougher than they look. Aren’t telescopic umbrellas finicky to deploy and store? I’ve read this complaint on various reviews. Yes, you do need to manually unsnap the ribs each time you repack it, however, this takes all of about 10 seconds (less to deploy it). No biggie. In four years of usage, I’ve never found it to be an issue and have yet to have one of the struts/ribs break on me. At 5.8 oz, the U.L. Trekking umbrella is some 2.2 oz lighter than the much-loved, but now defunct Golite Chrome Dome, (Note: The Chrome Dome, Gossamer Gear Liteflex Hiking, Six Moons Designs Silver Shadow and the Euroschirm Swing Liteflex are all one and the same umbrella. They just have different logos on them. All four models are made by Euroschirm). In regards to compactness, with a folded length of just 9 inches, it is some 16 inches shorter than its above mentioned competitors. This is significant from a storage perspective. Over the years, the one issue I have had with the otherwise excellent Golite model, is that when not deployed the umbrella tends to stick out over the top of a relatively small/lightweight backpack (see photo below). If you’re hiking on a well maintained pathway, this is not much of a problem. However, when hiking off-trail and/or on overgrown pathways, it has a tendency to catch on branches, bushes and felled trees. 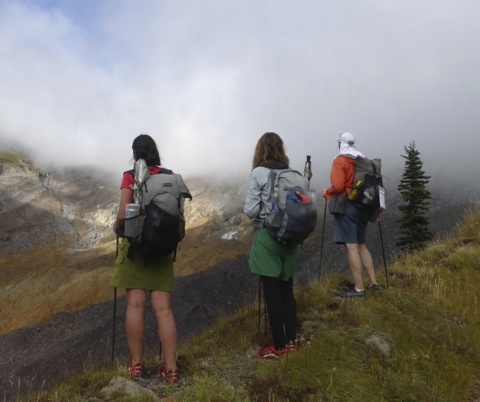 The two hikers on the left (Liz Thomas & Joshua Stacy) are both carrying the GoLite Chrome Dome; notice the height of the stored umbrella in relation to their backpacks? | Wonderland Trail, USA, 2014. As mentioned above, the Montbell U.L. takes longer to deploy than the Chrome Dome/Euroschirm umbrellas. In addition, due to its smaller canopy, the UL Trekking umbrella can’t match its larger-sized competitors when it comes to keeping the rain off you. Not so much the head or the upper torso, but from the hips down. Similarly, due to it’s smaller coverage it also lags behind in regards to keeping your pack dry. However, this last point is no biggie if you’ve lined the inside of your backpack with a trash compactor bag. A reflective umbrella will keep you significantly cooler than a non-reflective model when hiking in hot conditions. That’s the long-time consensus in the backpacking community. There’s only one problem ………..it’s largely a myth. Based on my experiences in the field (I used a GoLite Chrome Dome in 2006/2007, and then dusted it off for the Bibbulmun Track & Larapinta Trails in 2010) I’ve long believed that the discrepancy in temperature between hiking under a reflective canopy, as opposed to a non-reflective canopy, is negligible. One or two degrees max. Ryan “Dirtmonger” Sylva | One of the most accomplished desert hikers on the planet. 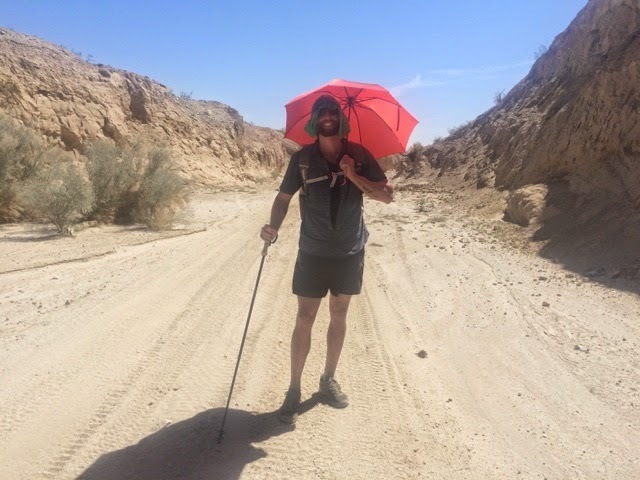 In 2013, Dirtmonger completed an incredible 3000 mile plus loop around America’s southwest – much of it in the sweltering summer months | He made the switch from the Chrome Dome to the Montbell UL Trekking Umbrella in early 2015. 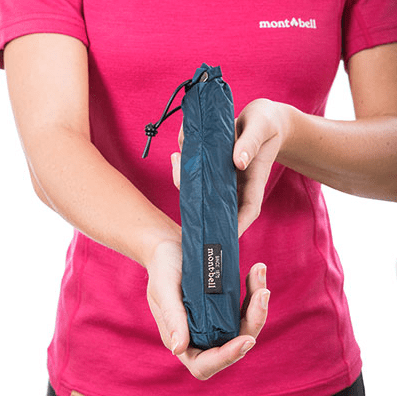 The Montbell UL Trekking Umbrella is not ideal for all conditions. I would not recommend it over its larger sized competitors for high precipitation areas such as the Scottish Highlands, Pacific Northwest or even the Appalachian Trail. 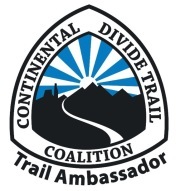 However, for long distance hikes such as the Pacific Crest & Continental Divide Trails, upon which an umbrella’s primary purpose is to provide shade / sun protection, I think it’s a better option than the heavier and significantly less compact Golite Chrome Dome (or equivalents). 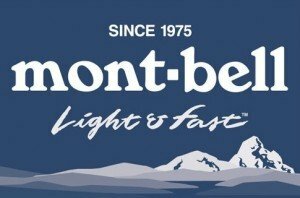 Disclosure: Cam Honan (thehikinglife.com) has been a brand ambassador and athlete for Montbell since 2014. He purchased this product with his own money in 2011. Great review……living in the UK we don’t have such a problem with too much sunshine, but we do get some rain!!!! I have used a collapsible umbrella on hikes but, although compact, mine isn’t the lightest and there’s the issue of trekking poles as well…..the main problem I find is, usually with rain there’s wind!!! Another great article Cam! I use the Euroshirm 8oz. Chrome Dome umbrella with a hands free rig made from items I already had. Nice dry place to eat chow or take a break and I will hang it from a tree limb and change clothes underneath. Windscreen for cooking, heck how about hanging clothing inside the canopy to dry! I could keep going! Thanks again Cam! Anyway thanks for your site, will be scouring this for sure for post-PCT adventures. Due to the wind factor, I’d be hesitant to go without a lightweight rain jacket to complement the umbrella. The PCT has some pretty exposed sections. All the best on your hike! The goal is to hike the JMT with a single umbrella. If the silver coating is a myth then score one point for #3. #3 has insane weight savings and is the most compact. So, for me the final question is wind. In the event of a unexpected strong gust–will the umbrella get shredded or will it merely turn inside out without breaking, only requiring me to pop it back the other way and perhaps stow it until the wind dies down, using only my light weight rain gear or hat/clothing if it’s a sunny and windy day. Recommendations? How has your Trekking umbrella held up to being blow inside out and returned to it’s right orientation? I’ve never had one of my umbrellas shredded, however, if it’s really windy I’ll just leave it stowed in the pack. In regards to recommendations for the JMT, I’d probably give the Travel model a miss (not convinced about its durability), and go with one of the Trekking umbrellas or the Sun Block. thanks! I think I’ll go with the sunblock after reading more. amazingly, of all the blogs about the sunblock, I’ve never read of or had someone reply in the comments that they’ve had their sunblock invert due to high wind. I keep trying to find someone who’s had it invert and then successfully pop back to it’s original shape. It’s some kind of marvel of engineering or people are very wise about putting it away during high wind so that it never risks inverting (blowing inside out). I keep trying to find out how well they hold up after inverting. thanks again for the feedback! One point I’d like to add is that temperature is one thing, but UV protection is another. I think it was Harvard that did a study on UV penetration of different-colored unbrellas, and found that only about 80% of the UV rays were intercepted by a medium-density colored umbrella (ie, red, brown, etc). Give me a reflective type such as the Montbell Sun Block Umbrella at 99.7%! I saw Montbell now has a 3 oz umbrella. Any chance you could borrow one from them for a review? I’ve seen them, but I haven’t used one as yet. I suspect they are ok in light rain/no wind/sheltered forest-type trails. I think I’d prefer to take the 2oz-3oz weight penalty and go with something a little bit sturdier. Note that it isn’t that hot in the southern Cal desert in March; not sure you will need an umbrella. I believe there is a situation where sun shading works wonders. Living in the UK you get used to chilly weather, even in summer, and your body acclimatises through the year. But the weather is very changeable, and when we get a sudden heatwave lasting a week or two in July/August, the sun beating down is difficult to bear when you aren’t used to it. The air temperature might be warm, but I usually reckon the sun adds 10-15C. A black umbrella helps a lot, but radiates some heat onto you like a lens. I have yet to try a reflective umbrella, and I can imagine it would be much better.